Some lesser-known specimens of the seesaw (or windmill) combination are presented. 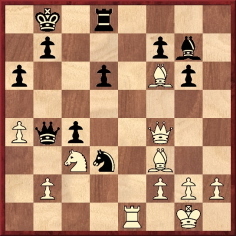 24 Rc7 hxg5 25 Rxg7+ Kh8 26 Rxa7+ Kg8 27 Rg7+ Kh8 28 Rxg5+ Kh7 29 Rg7+ Kh6 30 Rxg4 Kh5 31 Rd4 and White won (Black being mated at move 55). Source: Schweizerische Schachzeitung, July 1913, pages 107-108. 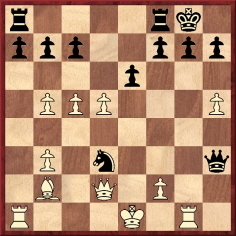 Source: American Chess Bulletin, March 1925, page 60. J.H. Zukertort – N.N., London, 1879. 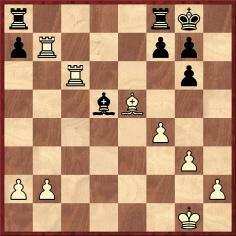 White played 21 Nxg4 Bxg4 22 Qxg4 Qxg4 23 Rxf7+ Kg8 24 Rxc7+ Kf8 25 Rf7+ Kg8 26 Rxb7+ Kf8 27 Rf7+ Kg8 28 Rxa7+ Kf8 29 Rf1+ Nf6 30 Rxa8+ Kg7 31 exf6+ Kg6 32 Rxh8 Resigns. 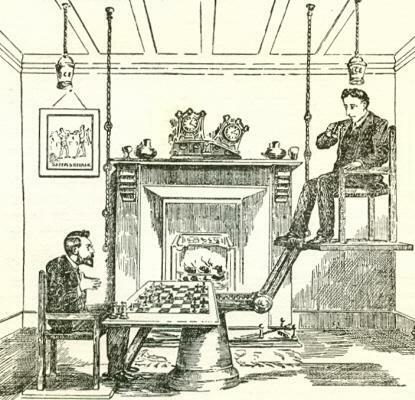 Source: Chess Monthly, January 1881, page 153. 22…Rxb2+ 23 Kxb2 Rb8+ 24 Ka1 Ba3 25 Rxe5 Bb2+ 26 Kb1 Bxc3+ 27 Kc1 Bb2+ 28 Kb1 Bxe5+ 29 Kc1 Bb2+ 30 Kb1 Bc3+ 31 Kc1 Bxd2+ 32 White resigns. 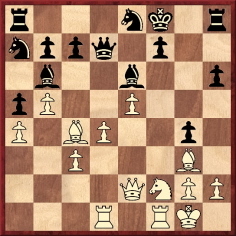 ‘(a) The pieces which enable the discovered check seesaw to be operated are not on the immediate scene as in the Torre game. (b) Two sacrifices, and not one, are necessary to make the plan work properly. 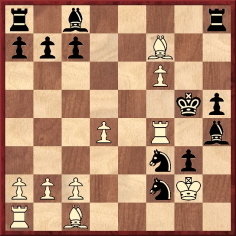 (c) The quiet 24th move by the king’s bishop was not easy to foresee. 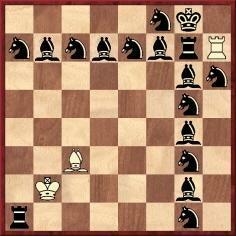 24 Bxd8 Nxf4 25 Re8 Ka7 26 a5 Bd4 27 Bc7 Bxf2+ 28 Kf1 Qxb2 29 Bb8+ Ka8 30 Bxd6+ Ka7 31 Bb8+ Resigns. 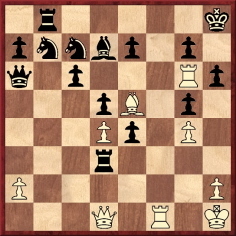 The Singapore team now telegraphed the unusual seesaw line 23 Rxf3+ Kg4 24 Rf4+ Kg5 25 Rxf2+ Kg4 26 Rf4+ Kg5 27 Rf1+ Kg4 28 Bc4 Re8 29 f7, and Black resigned. Source: La Stratégie, 17 September 1902, pages 277-278. The magazine took the score and notes by J.B. Elcum from the Singapore Free Press. 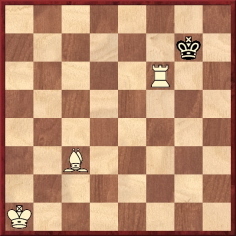 White, to move, is said to have won thus: 1 Rxg7 Rxd1 2 Rxe7+ Kg8 3 Rg7+ Kh8 4 Rxd7+ Kg8 5 Rg7+ Kh8 6 Rxc7+ Kg8 7 Rg7+ Kh8 8 Rxb7+ Kg8 9 Rxb8+ Kh7 10 Rh8+ Kg6 11 Rg8+ Kh7+ 12 Rg7+ Kh8 13 Rxg5+ Kh7 14 Rg7+ Kh8 15 Rxa7+ Kg8 16 Rxa6 Rxf1+ 17 Kg2. 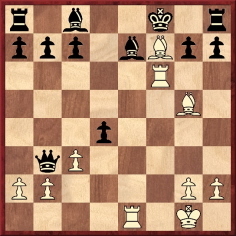 18…Qe6 (Mason: ‘Or 18...Be6 19 Rg7+ Kf8 20 Rxc7+ Kg8 21 Rg7+ Kf8 22 Rxb7+ Kg8 23 Rg7+ Kf8 24 Rxa7+ and mates in three more moves. 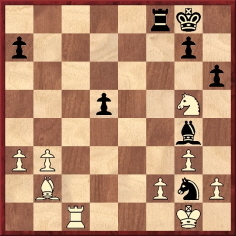 Either way, a very remarkable and beautiful ending.’) 19 Rg7+ Kf8 20 Rd7+ Kg8 21 Rd8+ and mates next move. 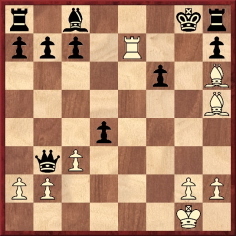 White wins as follows: 1 Rxg7+ Kh8 2 Rxf7+ Kg8 3 Rg7+ Kh8 4 Rxe7+ Kg8 5 Rg7+ Kh8 6 Rxd7+ Kg8 7 Rg7+ Kh8 8 Rxc7+ Kg8 9 Rg7+ Kh8 10 Rxb7+ Kg8 11 Rg7+ Kh8 12 Rxa7+ Kg8 13 Rg7+ Kh8 14 Rxg6+ Kh7 15 Rg7+ Kh8 16 Rxg5+ Kh7 17 Rg7+ Kh8 18 Rxg4+ Kh7 19 Rg7+ Kh8 20 Rxg3+ Kh7 21 Rg7+ Kh8 22 Rxg2+ Kh7 23 Rg7+ Kh8 24 Rxg1+ Kh7 25 Rg7+ Kh8 26 Kxa1 Nh7 27 Rg6+ Nf6 28 Rxh6+ Kg7 29 Rxf6. This composition was also given by Krejcik on pages 41-42 of his book Artige und unartige Kinder der Schachmuse (Leipzig, 1925). In C.N. 3301 Yvette Seirawan (Amsterdam) asked about the origins of ‘windmill’ and ‘seesaw’ as English-language terms for the combination known in German as ‘Zwickmühle’. 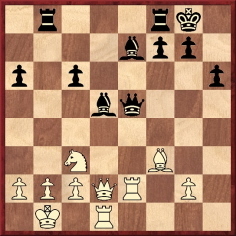 ‘Seesaw’ was used by Steinitz (‘a pretty so-called seesaw of checks finishes the game’) when annotating his loss against James McConnell in New Orleans, 1886, which was presented as a ‘hitherto unpublished game’ on pages 250-251 of the September 1897 American Chess Magazine. Earlier occurrences of the term are sought. 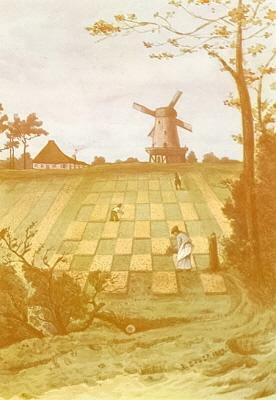 Zwickmühle was Nimzowitsch’s word in Mein System, but the extent of its prior use has yet to be ascertained, another open matter being the first appearance of ‘windmill’ in chess literature. The English translation, My System, put ‘seesaw’. The meaning of Zwickmühle is not ‘windmill’ but ‘double mill’, i.e. the term used in Mühlespiel (the board game known in English as Nine Men’s Morris). In his book Brettspiele der Völker (Berlin, 1931) Emanuel Lasker had (on pages 232-234) a section about Mühle, including references to Zwickmühle. As regards chess, Tim Krabbé devoted a chapter to ‘The art of the zwickmühle’ on pages 122-147 of Chess Curiosities (London, 1985). For complementary information, see pages 85-107 of the same author’s Nieuwe Schaakkuriosa (Amsterdam, 1977). The German expression ‘in der Zwickmühle sitzen’ is translated by our dictionary as ‘to be in a catch-22 situation’ and ‘to be in a dilemma’. This figurative meaning is lost in ‘windmill’ and ‘seesaw’. 26 Rxg6 Bxb7 27 Rxg7+ Kh8 28 Rxf7+ Kg8 29 Rg7+ Kh8 30 Rxb7+ Kg8 31 Rg7+ Kh8 32 Rxa7+ Kg8 33 Rg7+ Kh8 34 g4 Rfe8 35 Rg5+ Kh7 36 Rg7+ Kh8 37 Re7+ Kg8 38 Rxe8+ Rxe8 39 h4 Kf7 40 Kf2 Rc8 41 Bc3 Rd8 42 f5 Rd1 43 Kg2 Rd3 44 g5 Rd5 45 g6+ Kg8 46 f6 Rd6 47 f7+ Kf8 48 Bb4 Kg7 49 Bxd6 Kxg6 50 f8(R) Resigns. Latest update: 7 February 2016.